What is a family? The question has been on my mind for the past few months as I research and write on these close and distant relatives — figures ranging from my own mother, with whom I speak on the phone every evening, and, say, Fefa, my great-grand aunt whom I knew a little in Cuba, to Fanny G. Vidaud, who was Fefa’s third cousin or my second great-grandfather Alberto’s second cousin… Let’s face it, this family thing includes perfect strangers. The twigs in the family tree are so expansive that sometimes it seems as if they were growing in altogether different and far-flung woods. The Vidaud tree grows in Brooklyn as strongly as it does in Pau or in Guantánamo, but is it still one and the same tree? Can the arts of genealogical botany encompass all of us in any meaningful way? The fact, such as it is, remains that Fanny, for instance, and I do share a common ancestor, but what to make of it? As I recounted earlier, five French brothers went to Saint-Domingue during the Reign of Terror, and two of them, François Vidaud du Dognon de Boischadaigne (a.k.a. François No. 7) and Pierre Vidaud du Dognon de Pomerait (a.k.a. Pierre No. 10), were married and had children on this side of the Atlantic. The story, of course, is far more tangled and full of gaps than the sentence I just wrote would suggest. As it turns out, it seems that both brothers may have returned to France, yet later found themselves in Cuba, and suddenly they were back in France or… Be that as it may, Fanny, who descends from Pierre, and I, who descend from François, may be said to share some remarkable leaves in the book of botany. Through the work of other arboreal researchers who have posted their findings online, I can tell you that two of Fanny’s sixteen second great-grandparents and two of my two-hundred and fifty-six (yikes!) fifth great-grandparents are one and the same couple. His name is André Martial Vidaud and hers is Luce Jayet de Beaupré. (That’s her picture posted here and, truth be said, I detect a certain air de famille with both Fanny and me.) According to M. Vallantin Dulac‘s “Généalogie de la famille Vidaud du Dognon,” André Martial was “chevalier, comte du Dognon, seigneur du Carrier, de La Dourville, etc.,” and Luce was the daughter of Barthélemy Jayet, seigneur des Bauries, identified as “un des commensaux du roi,” by which are meant some prestigious things related to dining with the king… As the reader can see, the Blogger is crafting some elective affinities here; I’m strangely fond of Fanny, so I’m willfully sending a drone into the sky to take a global picture of our distant forests and, hopefully, perhaps even a quick snapshot of our gnarly common trunk. There are indeed documents from the past in which many of these figures I’ve been invoking are made to perform a collective act whereby one can confirm, if not the existence of a family, at least a familial make-up. A death in the family, so to speak, may trigger such an act. Consider the mournful faire-part posted here. On 20 October 1907, in Pau, Pierre Paul Vidaud de Pomerait, the comte du Dugnon, passed away at the age of 81. As the two final lines state, the Count was someone’s husband, father, father-in-law, brother, brother-in-law, uncle, first cousin, or yet another kind of cousin. If one reads the faire-part closely, one notices that it consists of just one sentence — one long sentence consisting of more than two-hundred and fifty words, elegantly punctuated by semicolons. What’s more, in a stunning feat of grammar, these multitudinous relatives, whose names occupy most of the faire-part, are the seemingly endless compound subject of the little single verb ont — “they have.” In fact, the subject of the sentence — the family members reunited here — contains sixty-three proper names, and that’s not even including “leurs enfants” (an untold number of children), plus a few other surnames thrown in vaguely at the end. The predicate of the sentence invokes a circumspect tale of universal mourning — an act of carefully orchestrated sympathy and mourning. All who are mentioned — this Monsieur, and that Madame, their proliferating “enfants” — “ont l’honneur de vous faire part de la perte douloureuse qu’ils viennent d’éprouver en la personne de Monsieur Vidaud Pomerait, Comte du Dugnon.” All of these variously interlocked names have the honor of sharing the painful loss that they have just suffered in the person of the Count. The person of the Count, alas, lacks a full proper name, but the faire-part itself, it must be said, is the pinnacle of propriety. As one of our French distant cousins mentioned in an email to one of my Miami not-so-distant cousins not long ago, families back then were “très protocolaires.” The person of the Count, I repeat, is an octogenarian body casting a last autumnal glimmer over a vast number of figures performing the action of a common verb. But who are these figures? The first three paragraphs — if those initial phrases can be called that — invoke the six members of the Count’s immediate family. Madame Vidaud de Pomerait, the Comtesse du Dugnon, was at first a mystery to me because, according to M. Vallantin Dulac’s “Généalogie,” the Count was a widower, his second wife having died by 1889. I wondered whether there could be an unaccounted-for third wife, but as it turns out, another genealogy inverts the order of the Count’s two marriages. It appears that his second (not first) wife was Delphine Chagneau, whom the Count married in Bordeaux in 1874, after the death of Claire Louisa Gallot Delesalle, his first wife and the mother of his two sons, in 1868. Listed next in the faire-part, the Baron and the Baronne Paul du Dugnon are the Count’s oldest son, Paul Joseph, who will now be the Comte du Dugnon until his death in 1913, and his wife, Herminie Ubelhart Lemgruber, who, according to Vallantin Dulac, was born in Rio de Janeiro into “une riche famille de banquiers brésiliens” and lived on 36, avenue du Bois-de-Boulogne, rechristened avenue Foch after the Great War. 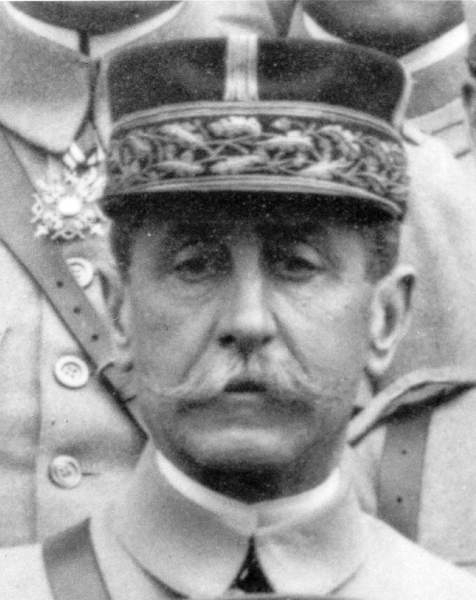 The Baron Louis du Dugnon is Louis Edmond Henri Vidaud du Dognon de Pomerait, the Count’s youngest son and a widower; like his older brother, he too would die not that long thereafter, on 17 October 1914, killed by shrapnel — “un éclat d’obus” — at the onset of the war near the Pas-de-Calais. Two children, Claire (after her paternal grandmother?) and Jean du Dugnon, are listed next. They are Paul Joseph and Herminie’s children; according, again, to Vallantin Dulac, Rosa Paule Claire would go to live in Brazil, while Jean Marie Paul, only fourteen upon his grandfather’s death, would become the comte du Dugnon after his father died. Jean himself did not have any descendants; more on him, the childless count, I hope, in an upcoming entry. The Count is then mourned by two widowed sisters and two widowed sisters-in-law, in that order. Their biographies and those of their dead husbands tell the transatlantic story of the Vidauds. Madame John Durand is Marie Anne Méloë Vidaud du Dognon de Pomerait, born in Gradignan, near Bordeaux, and married to a man from Brooklyn; I still don’t know what John Durand’s relationship to Étienne Octave Vidaud (Fanny’s father and the Count’s and Marie Anne Méloë’s late brother) might have been, but his name suggests deeper ties between the Vidauds and the United States than I was aware of. Madame Henri Lafont (not Lafond) is Marie Joséphine Vidaud du Dognon de Pomerait; she was born in Santiago de Cuba, where she married Henri Lafont, who was later a doctor in Pau, where he died in 1905. Madame Ernest Vidaud du Dognon de Pomerait is Marie Bernadac, whom we have seen before wearing a formidable headdress; her husband, also a doctor like Henri Lafont, is the rather handsome man whose face I tried to read several months ago in a belated and improvised act of physiognomy. 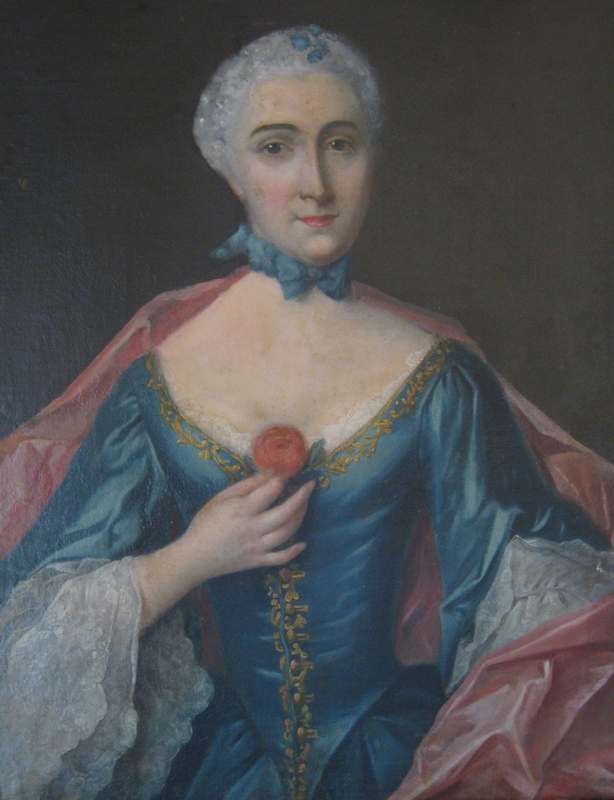 Madame Émile Vidaud du Dognon de Pomerait is Mariana de Arce, born in Santiago de Cuba. Émile too was born there, but lived in France before returning to his hometown. Next on the list of mourners are the Count’s nephews and nieces, plus the children of these, as well as some in-laws. First are the children of Étienne-Octave, the Count’s eight nephews and nieces born in Brooklyn: Robert, plus wife and children; Édouard, or Edward, a bachelor; three sisters married to men surnamed Van Nostrand, Clarke and Hunter; and three unmarried sisters, including Fanny, who — unlike her siblings, probably — must have met the Count and his immediate family on her European trips. Then comes John Durand, Marie Anne Méloë’s husband, followed by his son, Maurice, plus the latter’s wife and son. Suddenly there appear the rather mysterious Colonel et Madame Ulpiano Sánchez-Echavarría. Their name invokes the realm of operetta, but she happens to be Emilia Vidaud Arce, daughter of Émile Vidaud du Dognon de Pomerait and Mariana de Arce, and he a Teniente Coronel de Infantería, according to the Anuario militar de España, who fought for Spain during Cuba’s War on Independence. Then comes a solitary Mademoiselle Aguirre, who must be, following M. Vallantin Dulac, a certain Lola, the daughter of the Count’s sister, Fanny, who in turn was born in Santiago de Cuba and married one Elías Aguirre; Lola would die in Pau, but I don’t know why or when she moved there. (Our Brooklyn-born Fanny must have been named after her late aunt.) But one figure that stands out, simply because of the number of words attached to his name, is “le Capitaine d’Artillerie Henri Lafont, officier d’ordonnances du Général commandant la 14e division d’Infanterie.” Like his mother, Marie Joséphine Vidaud du Dognon de Pomerait, Pierre Henri was born in Santiago de Cuba, but died far from there, in Romania, on 29 November 1918, only less than three weeks after the Armistice. There is much about him on the Web. We know that he lived at 9, rue Montpensier, in Pau; that he had chestnut hair, gray eyes and a dimpled chin; that he died from an illness acquired on the front… The phrase “mort pour la France” often appears next to his name, and his name also appears on a plaque at the Invalides in Paris. I have also found his picture, reposted here, on several genealogical websites. It’s a melancholy countenance, that of General Lafont. I’m not sure how old he was when he arrived in France, and I wonder whether he had any memories of Cuba when, far from Pau, in the city of Iași, in eastern Romania across the border from present-day Moldavia, he knew he was dying. The next paragraph, which is also quite long, starts with various figures whose names are only vaguely familiar to me. But their connection to the Count can be ascertained by googling and clicking with a measure of intelligence and sang-froid. Yes, you must be alert not to lose your way in the forking paths, and yes, you must be willing to trespass in other people’s woods and climb their trees. Take, for instance, Monsieur et Madame de Masfrand. Who could they be? As it turns out, she is one Marie Henriette Clara Durand, who married Léopold de Masfrand, and her parents are Jean-Michel Durand and Marie Marthe Théophile Vidaud du Dognon de Pomerait (ah! who? ), who in turn is the deceased sister of Pierre Vidaud du Dognon de Pomerait, the Count’s father — which, if my botany doesn’t fail me, makes Madame de Masfrand the Count’s first cousin, right? That Marie Anne Méloë, the Count’s sister, is married to John Durand (or is it Duran?) of Brooklyn only serves to further entwine the windblown twigs. In the end, what matters more than absolute clarity is that all are reunited in the act of mourning and the faire-part’s grammatical subject. And then, in mid-paragraph, the faire-part invokes the various descendants, many living in Cuba, of François No. 7 and his two sons, Adelson and Adolphe. 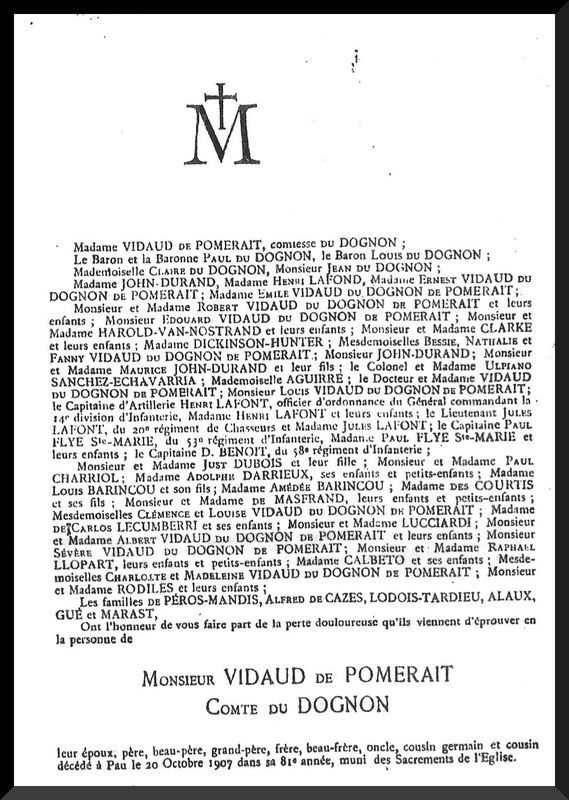 Marking Adelson’s primogeniture, his four daughters are listed first: the Mesdemoiselles Clémence and Louise Vidaud du Dognon de Pomerait, both unmarried; Madame de Carlos Lecumberri, whose name was Josefa, and whose husband was a lieutenant-coronel for Spain who appears to have died in Cuba’s War of Independence; and Madame Lucciardi, Suzanne, whose husband, Eugène Lucciardi, was a French diplomat stationed in La Paz, Santiago de Cuba, Sydney and Prague. (I shall come back to some of these characters in the future.) And then, finally, almost last and not quite least, are Adolphe’s two sons and five daughters: Alberto, plus his wife and children; Severo, the eternal bachelor; María, with her husband, Rafael Llopart i Ferret, children and grandchildren in Catalonia; Juana Amelia, also in Catalonia, whose husband, Rafael Calbetó i Sambeat, had already died; Carlota, who I believe may have lived with one of her married sisters; Magdalena, a pianist, who spent time in France and Spain (where she studied with Enrique Granados) before returning to Guantánamo; and Matilde, the youngest, married to Fulgencio Gonzales-Rodiles and the mother of María Magdalena, nicknamed Nunú, the notebook writer. What remains of all these names? The Count died more than a century ago, so the likelihood that anyone still alive knew him, or knew any of the various other figures mentioned here, is little. Fortunately, the children — those enfants mentioned over and over again — and even grandchildren are a different matter. 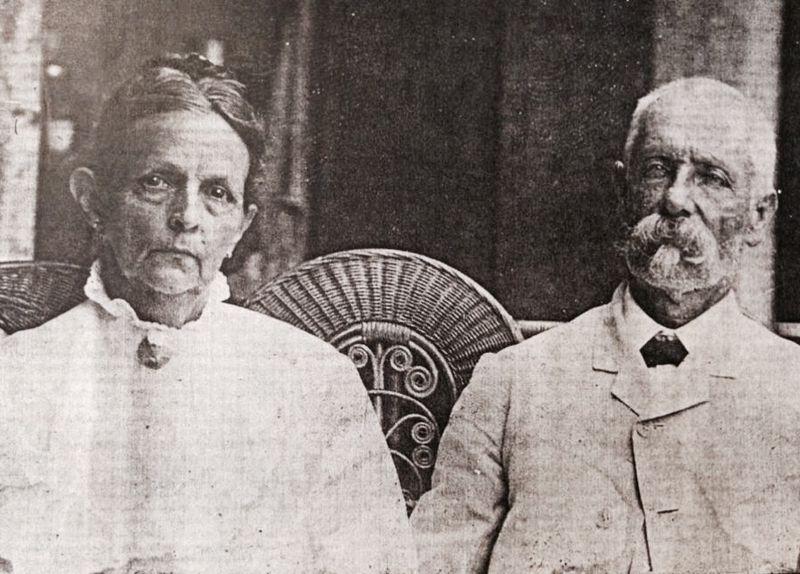 Consider the phrase “Monsieur and Madame Albert Vidaud du Dognon de Pomerait et leurs enfants.” Those names and nouns invoke my second great-grandfather, Alberto Vidaud Caignet, who owned (or not) La Reunión; his wife, Felicia Trutié Gautier, about whom I know little. This is their picture here, sitting on some veranda. They had four boys and three girls, and those children, all long dead by now, included Alberto Vidaud Trutié, whose grandchildren and great-grandchildren I’m just beginning to meet online; María Vidaud Trutié, or Maluya, my great-grandmother, whose picture I posted earlier; and Josefa Felicia Vidaud Trutié, our beloved Fefa, who took care of me and whose memory is still alive on both coasts of these United States, if not in Cuba itself. Those children lived in a provincial city in a newly independent republic in the Americas and, by an act of grammar, they, now young men and women, crossed the Atlantic and became subjects in the death of an old man — a nobleman yet, like in some uncanny fairy tale — who lived in another provincial city in a far older republic that once upon a time had been the mightiest kingdom in Europe, and… The rest, I’m afraid, is blogging, by which I mean imagining things, making up stories. If every story has a narrator and a narratee, as a distinguished Frenchman once put it, inquiring minds may want to know who tells the tale told in the faire-part and to whom it is addressed. I don’t know who authored the announcement of the Count’s death, but the their-person voice in the text fashions itself as omniscient. It knows all in the family and their degree of proximity to the Count’s person. It speaks to a figure succinctly identified as “vous” — a “you” to whom the multiple names that make up the subject of the sentence communicate the news of a painful loss. As fossilized as its formulaic language may sound, the faire-part still speaks to me. But if I identify with the “you” to whom the sad news is told, I may well assume I’m not a member of the family, if only because I was born decades later. Yet, even as I undertake the announcement of the Count’s death to you, whoever you may be, I become its new narrator, perhaps even a new subject in this ancient grammar of mourning. Strangely, belatedly, I too become a melancholy figure not unlike any other member of the family, whatever we may mean by family. Posted on June 19, 2015 June 23, 2015 by robertissimus	This entry was posted in Cuba, Death, Family, France and tagged Adelson Vidaud du Dognon de Boischadaigne, Adolphe Vidaud du Dognon de Boischadaigne, Alberto Vidaud Caignet, Alberto Vidaud Trutié, André Martial Vidaud comte du Dognon, Émile Vidaud du Dognon de Pomerait, Étienne Octave Vidaud du Dognon, Carlos Lecumberri, Carlota Vidaud Caignet, Château de la Dourville, Claire Louisa Gallot Delesalle, Clémence Vidaud du Dognon de Pomerait, Delphine Chagneau, Elías Aguirre, Emilia Vidaud Arce, Enrique Granados, Fanny Georgiana Vidaud, Fanny Vidaud du Dognon de Pomerait, Felicia Trutié Gautier, François Vidaud du Dognon de Boischadaigne, Fulgencio Gonzales-Rodiles, Henri Lafont, Herminie Ubelhart Lemgruber, Jean Paul Marie Vidaud du Dognon de Pomerait, John Duran, Josefa Felicia Vidaud Trutié, Josefa Vidaud du Dognon de Pomerait, Juana Amelia Vidaud Caignet, Léopold de Mastrand, Lola Aguirre Vidaud, Louis Edmond Henri Vidaud du Dognon de Pomerait, Louise Vidaud du Dognon de Pomerait, Luce Jayet, Magdalena Vidaud Caignet, María Magdalena Gonzales-Rodiles Vidaud, María Vidaud Caignet, María Vidaud Trutié, Mariana de Arce, Marie Anne Méloë Vidaud du Dognon de Pomerait, Marie Henriette Clara Durand, Marie Joséphine Vidaud du Dognon de Pomerait, Marthe Théophile Vidaud du Dognon de Pomerait, Paul Joseph Vidaud du Dognon de Pomerait, Pierre Henri Lafont, Pierre Paul Vidaud de Pomerait Comte du Dugnon, Pierre Vidaud du Dognon de Pomerait, Rafael Calbetó y Sambeat, Rafael Llopart i Ferret, Robert Pomerait Vidaud, Rosa Paule Claire Vidaud du Dognon de Pomerait, Severo Vidaud Caignet, Suzanne Vidaud du Dognon de Pomerait, Ulpiano Sánchez Echavarría, World War I. Bookmark the permalink. Oh, Rober, es el caso decírtelo en otras palabras: pocas veces un virtuoso (narrador) ha estado más cerca de su virtud. Tal vez no lo creas; tal vez sospeches -vía nuestra hermandad astral- que exagero; tal vez resuelvas que a causa de la última anestesia general y del poco dormir luego, he venido a perder el juicio. Pues bien: si así están las cosas, lamento decepcionarte. Tras cerciorarme releyéndote en las horas normales y en las horas pequeñas ((‘le ore piccole’, in italiano parlando) y a diversas alturas y en casi todos los rincones de casa, no ha cabido duda, no ha podido caberla: Tienes (‘tenés’, piensa Andrea) en puño un discurrir de dimes y diretes, un modo de decir modos en punta de pies, un presente… reservados sólo a esos poquísimos novelistas que ponen al descubierto – “como si nada”- un mundo como de la nada. Perdóname la insistencia, caro carissimo.